Standard Liege fans who made a banner depicting a cartoon of the severed head of Anderlecht midfielder Steven Defour could face five-year bans and fines, the Belgian interior ministry says. 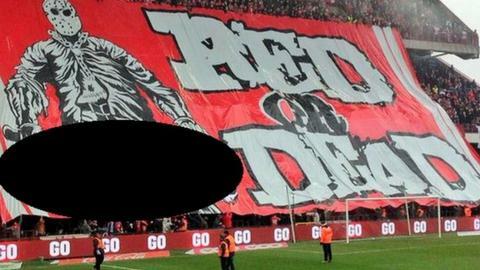 The banner, also showing a man with a sword and the slogan 'Red or Dead', was unfurled when the teams met on Sunday. Defour joined Anderlecht in the summer, three years after leaving rivals Liege. "We're working with police to catch as many of the authors of this banner as possible," a ministry spokeswoman said. She added individuals faced fines of up to 5,000 euros as well as the lengthy stadium ban. Belgian politicians have voiced their anger over the banner. "The banner... was in bad taste, it was stupid and unacceptable," Belgian Foreign Minister Didier Reynders tweeted. Fellow Standard supporter and former prime minister Yves Leterme also expressed his disappointment on the social networking site, writing: "Standard-Anderlecht has been ruined by a minority of supporters. I remain a supporter but feel ashamed by the banner tonight." Belgian football officials have also reacted angrily with Thibault De Gendt of the country's FA saying: "It was disgusting and took place in front of children. We hope never to see this again." Bob Madou, the Belgian Football Federation's communications chief, said: "This banner was in bad taste and unacceptable to Standard and Anderlecht. "There is nothing in the rules against it but we will see what we can do about it." The banner - which appeared to reference the fictional character Jason Voorhees from horror film Friday The 13th - was unveiled before kick-off, as fans targeted their former captain, who had spent five years with Standard Liege before signing for then Portuguese champions Porto in 2011. Defour, 26, made the controversial switch to Anderlecht last summer for a fee of 6m euros. A cartoon has been posted on the Facebook page of Standard fan group 'Ultras Inferno 1996' with the caption "I'm sorry" and a Jason figure holding a board saying "or not". Defour, who played for Belgium at the 2014 World Cup, was sent off early in the second half of the game, which his side lost 2-0, after picking up a second booking for kicking the ball into the home supporters. After the game he posted a message on social media, saying: "Apologies to my fans and team-mates at Anderlecht, although I do not understand the red card - you cannot see or hear the referee."